A friend posted in one of my fb groups this question, "Do free markets and privatization encourage monopolies?" I replied that innovation creates temporary micro monopolies. Government franchising, local and natl govts, create permanent monopolies. From tricycle route monopoly to electric coop area monopoly. These guys dislike land privatization, they want communal or state ownership of all lands in a country. Below are some of the georgists' arguments. My late father owns about 2-3 hectares of land in the province that he bought many decades ago out of his entrepreneurial savings. He has no right to "legitimately own" that land? And give to us later? If no, who should own it, the commune? the state? 2. "He can enjoy the rights of ownership of the land, but land is ultimately common." Meaning he cannot pass ownership to his children, surrender ownership to the commune? Lousy philosophy. If that is the case, owners of land won't plant long-gestation crops like forest trees, mango and coconut trees, etc. Next round of inheritors who have zero interest in trees will simply cut those mature trees, sell the lumber, enjoy the money in partying and the land is back to being idle. Lousy philosophy, very anti-market. 3. "People lease land and make productive use of it all the time." Wrong. Many people have no interest in rural land, they want the money quick and go to the cities or live abroad. It is the inheritance among families that often ensure productive use of the land. 4. "Private landowners can sit on a piece of land without doing anything to it." It is fine, it's a gamble that land price will rise quick, or it may not. Instead of higher price, one may get higher cost of protecting an idle land -- from govt politicians, bureaucrats and their friends, from armed extortionists like NPAs and Abus. Currently local governments collect rent via real property tax (RPT). They can even confiscate private lands with high unpaid RPT. Then local govts enjoy the money even if all they do is play politics. 5. "Land speculation is wrong." Speculation, boom and bust, risks and rewards, expansion and bankruptcy, are 100% part of free capitalism's DNA. Remove speculation and business gamble, it's not free capitalism anymore. 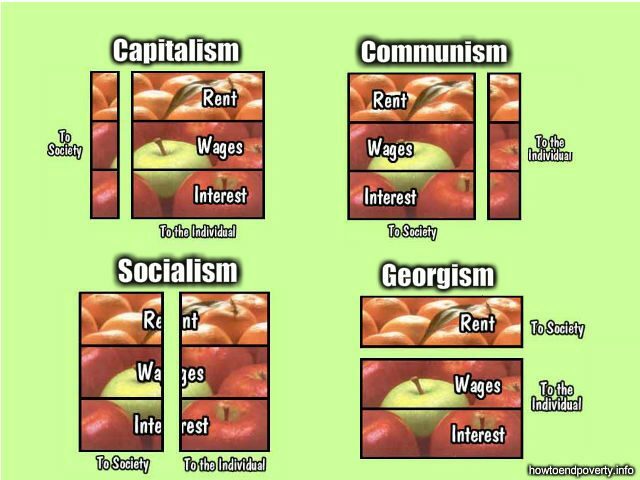 The georgists hate privatization of land, that land ownership should be communal, belong to the commons. This is anti-free market philosophy. The essence of market capitalism is private property, not common/communal property. Speculation is about risks and rewards, it's not all rewards, that they call "rent". Capitalism without bankruptcy is like religion without sin. Likewise speculation without risks is like religion without sin. These guys cannot support private property in land capitalism. Sunlight, wind, rainwater we cannot occupy; land, even portions of a river or lake we can occupy, we can establish private prop there. Sunlight, wind, rainwater we cannot create but we can create land (thanks to modern reclamation tech), we can create man-made lakes. Land speculation is not a problem. Too many people got burned waiting for their land prices to go up fast but failed. When state-connected land grabbers, when armed extortionists like NPA and Abus, when professional squatters come, the value of their land decreases, not increases. 6. "Land has no cost to bring into production." Wrong. Land populated by NPAs and Abus has no value to you or anyone else unless you are part of these extortionist groups too. The Ayalas, the Sy family, etc. will not buy or develop this type of land even if sold to them at P1/sq.m. A bare land, populated only by snakes, frogs, rats, other wild animals (and assuming no extortionists as mentioned above) has very low value. The same land developed by land speculation capitalists -- with concrete road, drainage, canals, street lights, multipurpose hall with swimming pool, etc. -- has high value. I support this type of land speculation. 7. "The supply of land is fixed." 1. Land reclamation everywhere makes the land ever-expanding. The space where the new HK airport is now based used to be a sea. Many structures in Dubai are sitting on formerly a sea, again thanks to land reclamation. 2. What is inland water like a wide lake or river or marshland, part or whole of it can become land. 3. Hilly or mountainous land good only for bushes and snakes and rats to reside can become expensive mt resorts. 4. Some 1,500 hectares of land was non-existent in Metro Manila before, until the Bay City in Manila Bay was created via land reclamation, hosting the CCP complex, Financial Center area (PNP, PAL, WTC, GSIS,...), CBD (SM MOA, etc). About 2 more big land reclamation projects at Manila Bay are planned, about 600 hectares each. 5. China's artificial islands at the SCS/WPS. It is through the land speculation of capitalists and entrepreneurs, the risks they faced and the rewards they might get someday, or they may lose even their shirts when the costly land devt project flops. Gains from land use can be called economic rent or econ profit as a result of land development and speculation. Or it can be economic disaster if the project flops. Common or communal ownership of land. Communism, lousy. 7 " 'Land" includes water and all other natural resources'. Sigurista masyado. Pacific Ocean is land, Atlantic Ocean is land, agh! But then again, people are entitled to their illusion. Geo-commies argue that even the seas and oceans are "land" and hence, cannot be privately-owned. I'm floored by that argument, really weird and funny. So I will call the geoism movement as a leftist movement. No private ownership of land, only common, communal ownership, lousy. Liberty is individual, not national or clan or communal liberty. The same way that property rights refer to private property, not national or communal ownership. Private property, period. Disrespect private property and private ownership, that's leftism for me.